“I’ve actually thought about taking my old Gamma Hiking pants and turning them into shorts” our gear tester said when they got these new Gamma LT Shorts. “I love the Gamma pants, and thought I should just make my own shorts.“ At the end of the testing period, our tester was not disappointed, “With these Gamma LT shorts I now have a pair of shorts I can use when it’s too hot to wear my Gamma Pants!”. Pants are essential and trustworthy, but sometimes shorts are more comfortable. The Arc’teyx Gamma LT Shorts take the greatness of Gamma Pants and turns them into the sleekest, most comfortable softshell shorts we’ve ever tried. 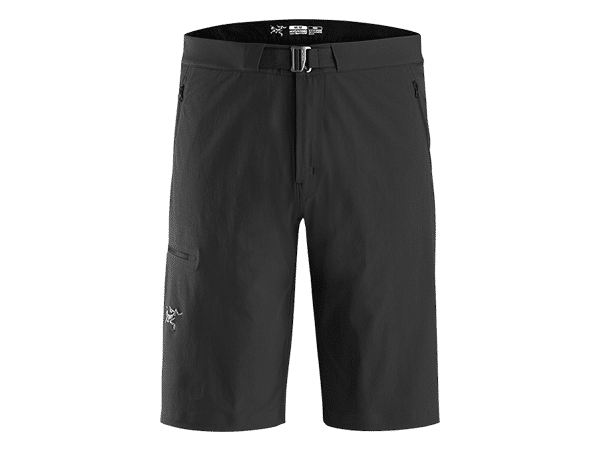 If you’re looking for a solid pair of hiking shorts and love shorts that have some stretch and last forever, we don’t think you can go wrong with these. Arc’teryx’s Gamma LT Softshell Pants are known for their water-and-wind resistant sleek design. Many hikers rate the Gamma LT pants as their favourite all-weather hiking pants. 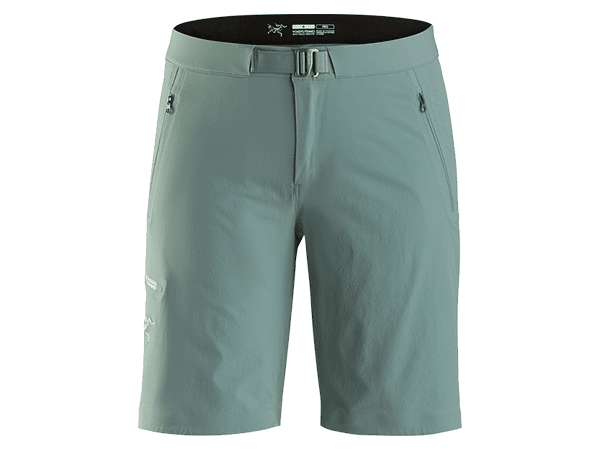 The Gamma LT Shorts pack that same trim design, weather-resistance, and lightweight comfort into the best pair of hiking shorts on the market. There are men’s and women’s version of these great shorts. All summer long, whether hiking, mountain biking or just heading about town. The weather resistant softshell fabric keeps you cool and dry when moving fast and warm and dry when the weather turns sour. Breathable + Super Comfortable. We already love the Gamma pants for their ultralight, breathable softshell fabric. These are just as good. The stretchy fabric is what we love most, especially when trying to get over a little scrambly section or relax around the fire at the end of the day. Weather Resistance. 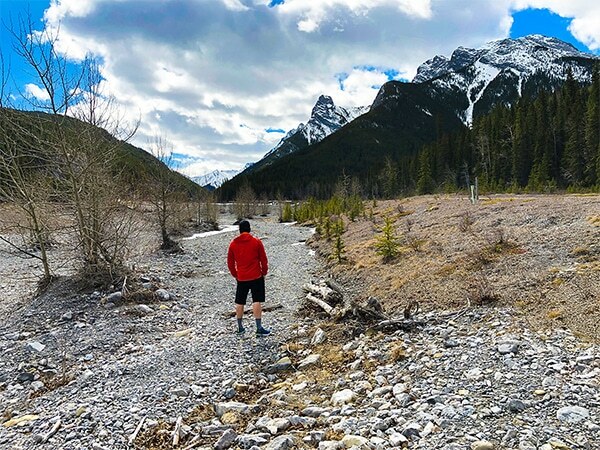 The abrasion-resistant softshell fabric repels water and dries out quickly, so they’re an excellent choice for hiking in light summer rain…if you don’t mind your legs getting wet. Great Minimalist Features. They’ve got the same zippered hands pockets and thigh pocket as the Gamma pants, as well as the integrated belt. But that’s really it – are these straight-up minimalist shorts. They last a long time. Some of us have Gamma LT pants that are over a decade old, and they see a lot of wear. If these shorts have the same longevity, expect to wear these for a long time! Pocket. We love a rear pocket on all our gear. While we got used to having our wallet in the front thigh pocket, we’d still prefer a rear pocket. If there’s one reason to reach for these shorts, it’s because they are so lightweight and comfortable. The latest model uses Fortius DW 2.0 – an 88% nylon and 12% elastane blend that gives the shorts just the right amount of stretch. 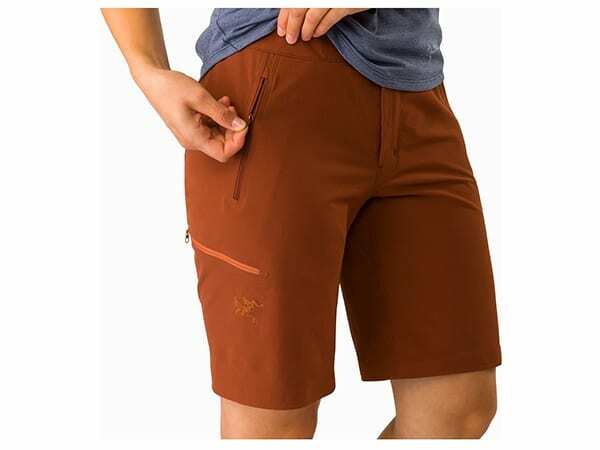 The fabric is relatively thin and light – closer to gym shorts than everyday cargo shorts or your typical hiking shorts. They’re billed as abrasion-resistant and we’re confident they’ll hold up to heavy wear. 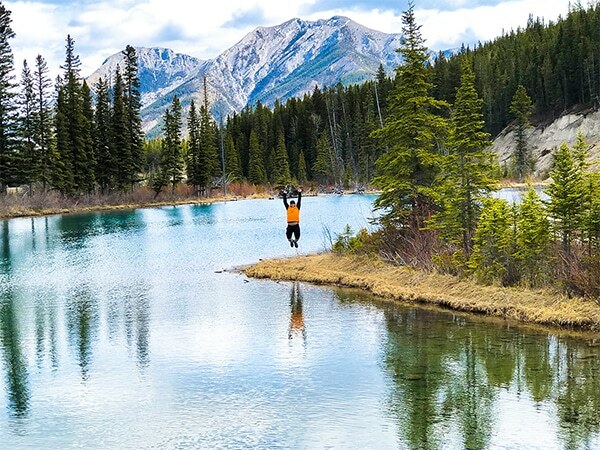 Overall, we found them more than comfortable for summer hikes in the mountains – or even chillier trips if you’re the high-speed, low-drag type of hiker. The fit is trim and neat, but not tight – and certainly not baggy, in keeping with Arc’teryx’s customary slim design. We find we can move quite comfortably and nimbly, thanks to the stretch. At the same time, we appreciate that they don’t feel like we’re wearing Spandex bike shorts or something. We also found them amply breathable. They may be a bit stuff when working up a sweat on very hot days, but they are shorts, so they have plenty of de facto ventilation. Arc’teryx gear tends towards the minimalist side when it comes to design, and the Gamma shorts and (and their full pant counterparts) stick to that tradition. 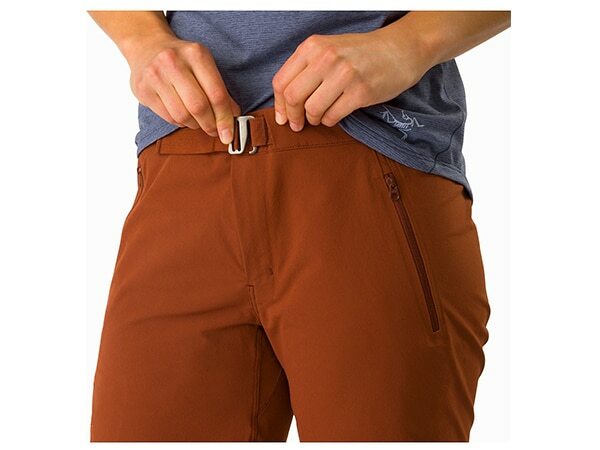 They keep the two hand pockets that the Gamma pants have, and these pockets rock neat, low-profile zippers. (These zippers weren’t found on older Gamma pants from previous years. Trust us – these are a big improvement.) Since the pockets are angled, these zippers are more than welcome, and make the pockets a great place to stash essentials like your phone or wallet. 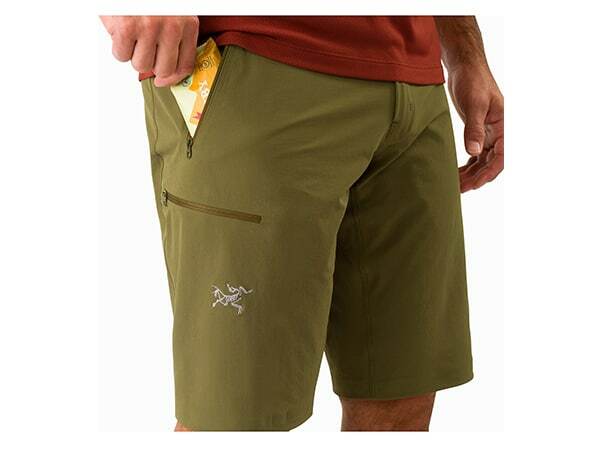 We’re also glad that the Gamma Shorts kept the pants’ horizontal thigh pocket, which also rocks a zipper. We appreciate the storage and utility this added pocket provides and like to throw a snack or two in there. Another holdover from the pants is the integrated belt in place of a drawstring waistband or elastic waistband.  In classic webbing belt design, it’s super easy to use and more convenient than carrying a belt around (not to mention much more secure and more adult-looking than the elastic waistbands that some hiking shorts rock). We love the Gamma LT Shorts. They’re downright comfortable, the perfect weight for hiking, and provide excellent weather resistant for wet days without sacrificing much breathability. The sleek design is classic Arc’teryx: low profile and athletic. Damn! Now I need to save up to buy these. I love the gamma pants and have been wearing gym shorts the last couple of years. These sound like they could be perfect. It's a good brand. I got the hoodie already, looking for what more they offer. This might be great for the upcoming summer. By the way, I think there is a spelling mistake on Arc'teryx in one spot.